Filmed before a live audience at Hamners’ Variety Theatre in Branson, MO! 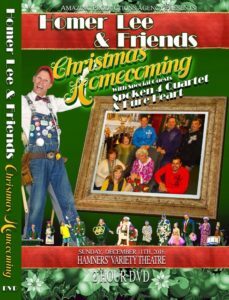 Homer Lee, Grandma Beulah & their guest stars Spoken 4 Quartet, Pure Heart, Ezrah Noelle & Rosie Cheek, Miki Cunningham, Dylan Pratt, & SANTA himself! This is 2 shows in 1! The first half is family gathering at Grandma Beulah’s home for the holidays & practicing for the BIG show! 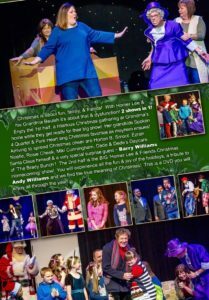 Pure comedy & your favorite Christmas songs ensue! Plus, see ‘The 12 Days of Christmas’ like you’ve never seen it before! The second half has the true joy of the holidays & the real meaning of Christmas! This is a DVD you will watch all year long! 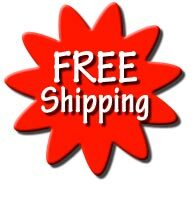 Only $20.00 & FREE postage/handling! This is Homer Lee’s newest variety show with many of his talented friends – The Homestead Pickers from Silver Dollar City, Branson legend Bob Hubbard of the Foggy River Boys, Jamie Haage, Matt Gumm of The Clay Cooper Show, Willie Nash as Ray Charles, Krista Meadows, The Central High School Kilties Drum & Bugle Corps, Mandi Denney, & Brenda Meadows! Enjoy this 2-hour variety show plus, our tribute to 9-11 with special guest Sergeant Major Tony Rose, survivor of the 9-11 attack on the Pentagon. The theme for our 2016 variety show is “WOW!” & you will be “WOWED!” by this non-stop cavalcade of music, comedy, & the greatest heart-felt tribute to the United States of America! Only $25.00 & that includes shipping & handling! Order now, get 1 for yourself & extras for Christmas gifts! If you buy more than 1 the others are only $20.00 each! 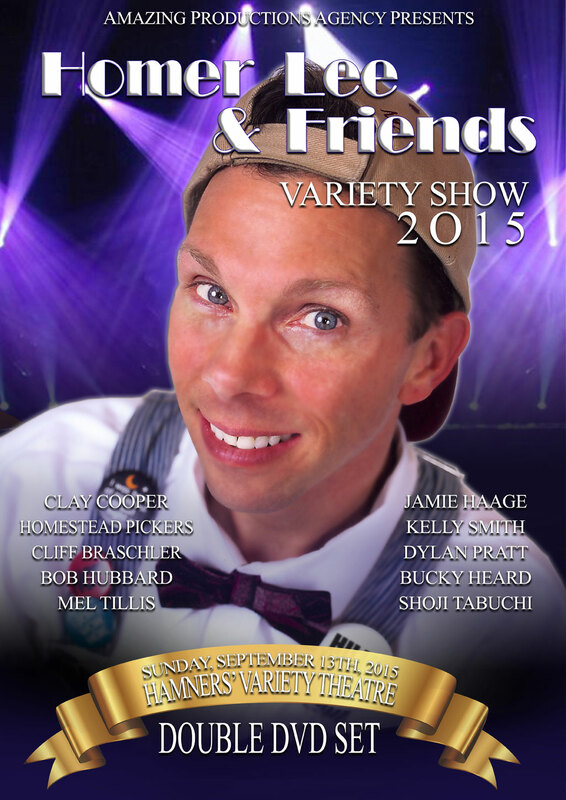 Filmed before a live SOLD-OUT crowd at Hamners’ Variety Theatre on Sun., Sept. 13th! Terry ‘Homer Lee’ Sanders has his friends together for truly the BEST show he’s ever produced ~ EVER! The theme for this show was “Surprise!” & from the BEGINNING, when Terry was surprised with a “Shout-Out” from his 99 year old 4th grade teacher Bonnie Maxwell, until the END, when Clay Cooper has his “New fiddler” accompany him… SHOJI TABUCHI! 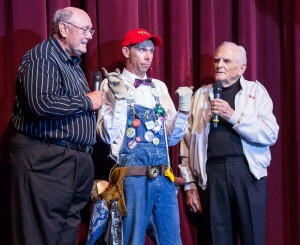 Plus, they needed a “stagehand” to help out… MEL TILLIS! Enjoy this NEWEST ‘Homer Lee’ DOUBLE DVD set ~ over 2 hours! 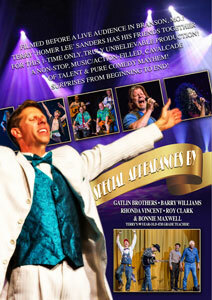 A non-stop, music/action-filled, cavalcade of talent & pure comedy mayhem! 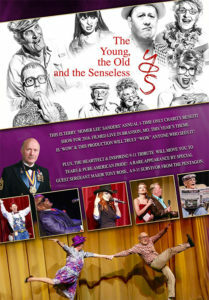 Starring Terry Wayne Sanders as ‘Homer Lee’ & MANY other characters! 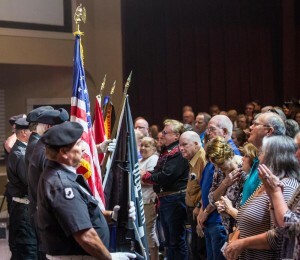 One of the BEST patriotic tributes to our veterans that will move you to tears & make you stand~up with pride! 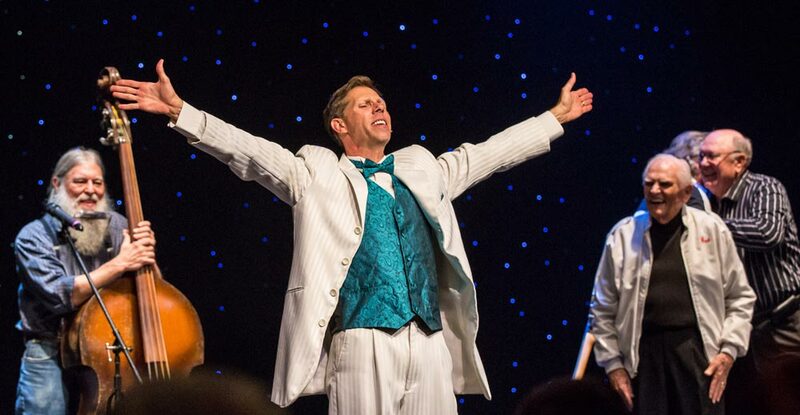 Scenes from this 2015 Show!! Click images for a slideshow! 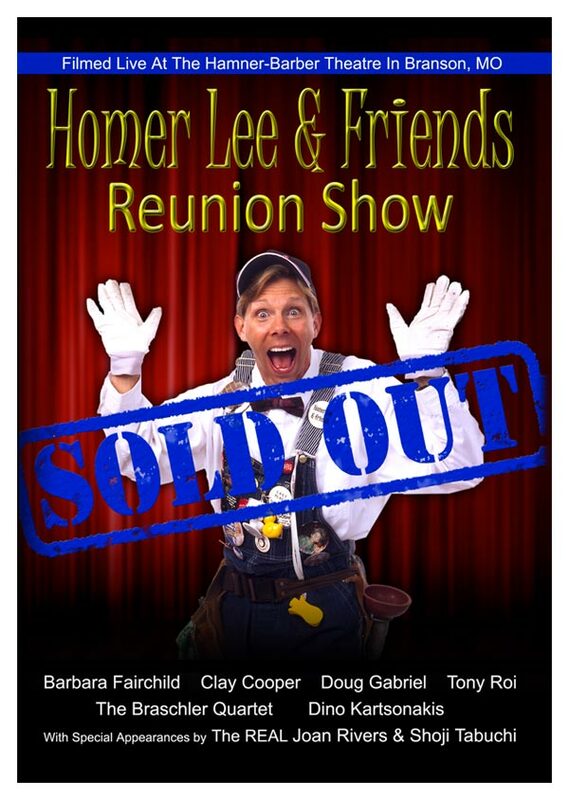 ‘HOMER LEE & FRIENDS REUNION – Sold out Show 2012’! 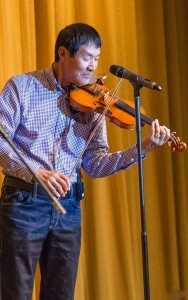 Filmed before a live SOLD-OUT crowd at the Hamner-Barber Theatre on Sunday, August 26th, 2012. 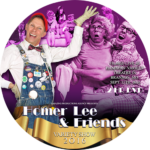 Homer Lee & many of his Branson friends have gotten together for a ‘reunion’ show that will be talked about for years to come! 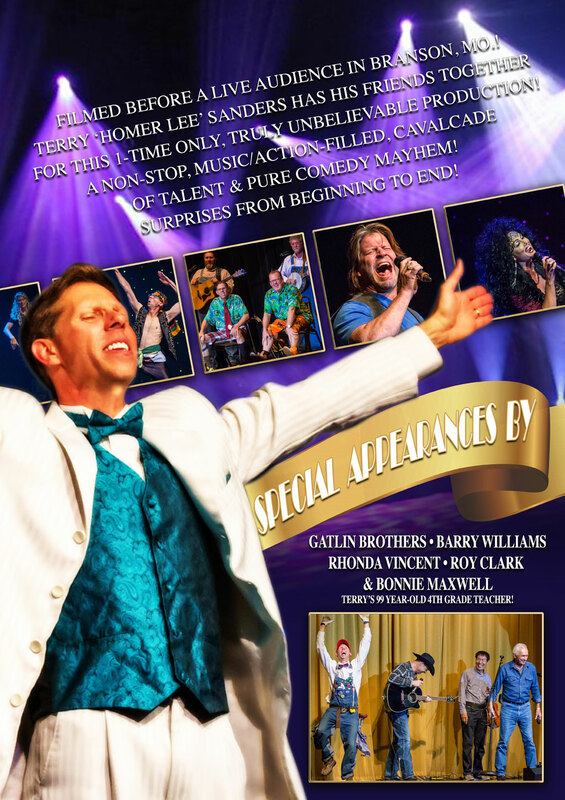 Join Terry ‘Homer Lee’ Sanders & his many personas (Homer Lee, Fred Smoot, Shoji Tabuchi, Joan Rivers, & Gma Beulah) along with Barbara Fairchild, Clay Cooper, Tony Roi, Doug Gabriel, The Braschler Quartet, 4 of the female singers from the Braschler Music Show, the Braschler band, Brad Bacon, cast members from the ‘Corn Crib Theatre’ ‘Toby Show’, Bob Leftridge, & many more! 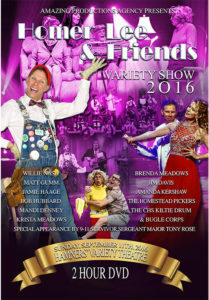 Plus, special appearances from the REAL Joan Rivers, the REAL Shoji Tabuchi, Dino Kartsonakis, Gary Wilkinson of the Wilkinson Brothers, & some Branson folks you have loved over the years! This TRIPLE DVD set is currently SOLD OUT, just like the show! We will have more in the fall. Please check back later. It’s here! “The 25th Anniversary of the Many Faces of Terry Wayne Sanders.” Branson’s favorite comedian has done it again & this time in style. Here is his most recent project, a 3-hour double DVD set. 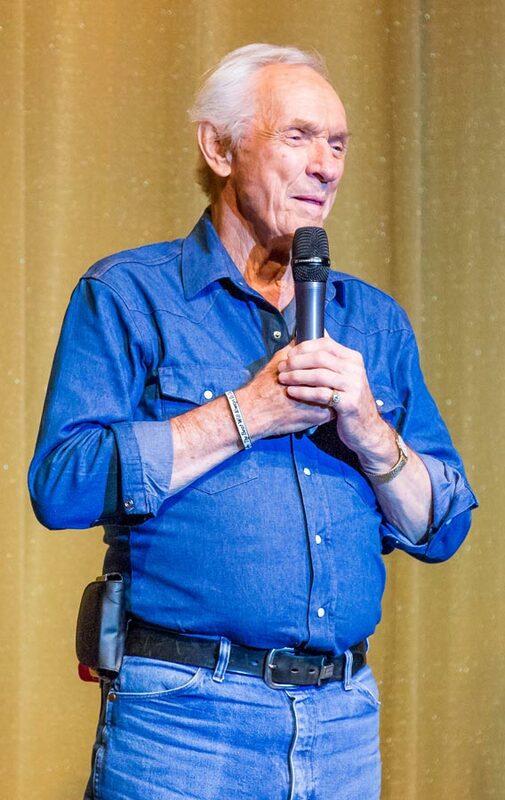 All of his work over his 25 years in show business. See Terry in action at every one of his jobs! At Silver Dollar City as ‘Deputy Birdy Tweedle’, ‘Mr. M. Balmer’, & ‘Ickibod the Scarecrow’. 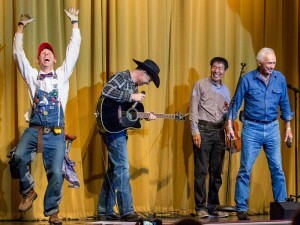 On the stages of Branson including his last 4 comedy routines with the Braschler Music Show as ‘Gma Beulah‘, ‘Grandpa Tabuchi‘ (Shoji’s Grandfather), ‘Homer Lee‘, & ‘Cher‘. Yes, he’s Cher like you’ve never seen her before & you won’t believe the outfit he has on. Those boots really are 7 & 1/2 inches tall! 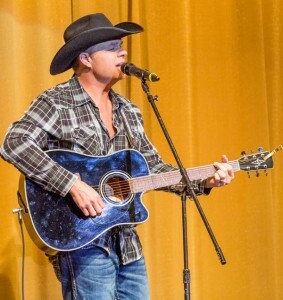 Here’s your chance to see him as ‘Terry the Tour Guide’ a character that he’s played now for 13 years in his own TV show called ‘Branson Country’ with his 2 sons, Austin & Evan on The Vacation Channel. 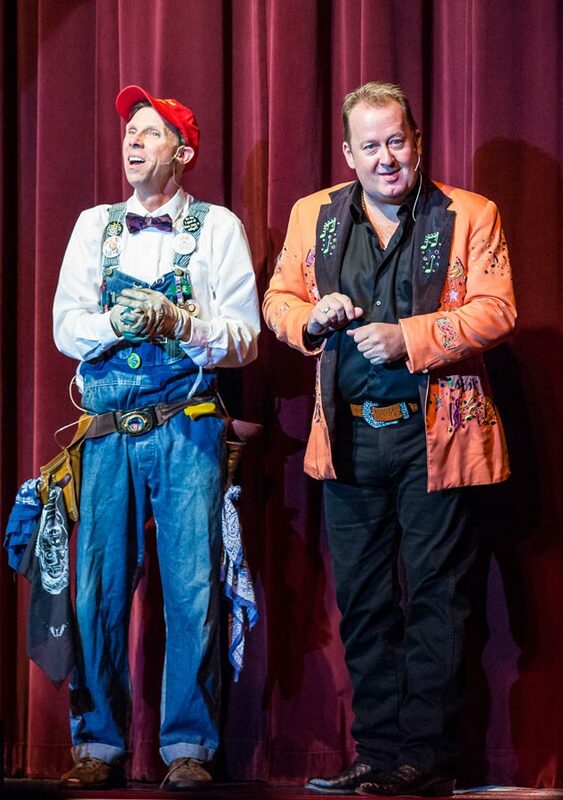 Also see him as ‘Ollie Stewart’ in the Shepherd of the Hills outdoor pageant. And, as you’ve never seen him before, as ‘Mrs. Ida Wheeler’ from the same play. The cast had no idea he was going to play this role! In 1989 Terry was cast in the longest running variety TV show ‘Hee Haw’ & here is a look at him on nationwide TV with some behind the scenes scoop. Plus, see Terry’s many TV commercials, TV appearances, movies, etc. It has guest stars too! 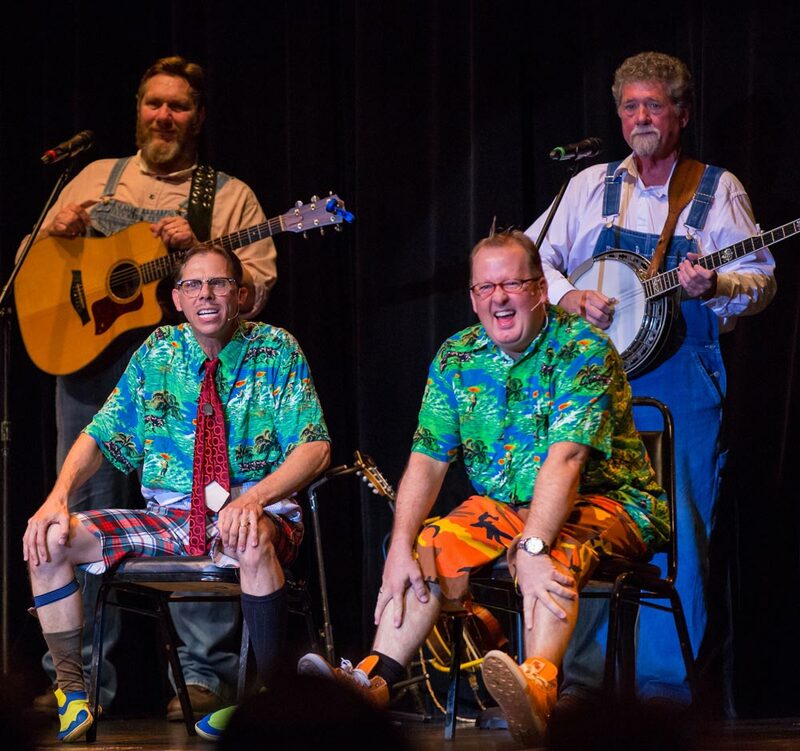 Jim Stafford, the Oak Ridge Boys, & many surprises. Plus a special tribute to Mr. ‘Shad’ Heller. This is an incredible 3-hour double DVD with the most outrageous out takes you’ve ever seen! This is the one DVD that you must have! The 3-hour double DVD set is only $20.00 & FREE shipping! This DVD is currently SOLD OUT. Please check back in the fall, we’ll have more of them available to order later! OR pay with a check.